We've had a busy summer! Congrats to all of the following students for successfully defending their thesis! Next up: Sean accepted at PhD assistantship in the Neeson lab in the Department of Geography and Environmental Sustainability at the University of Oklahoma. Next up: Kate accepted a PhD assistantship in the Southern Illinois University at Carbondale Cooperative Wildlife Research Laboratory under the direction of Dr. Clayton Nielsen..
Michael Jungen: Eastern Diamondback Rattlesnake (Crotalus adamanteus) External Radio-Transmitter Attachment Method and Long-Distance Translocation Survival. Next up: Mike recently accepted a position with the Missouri Department of Conservation. 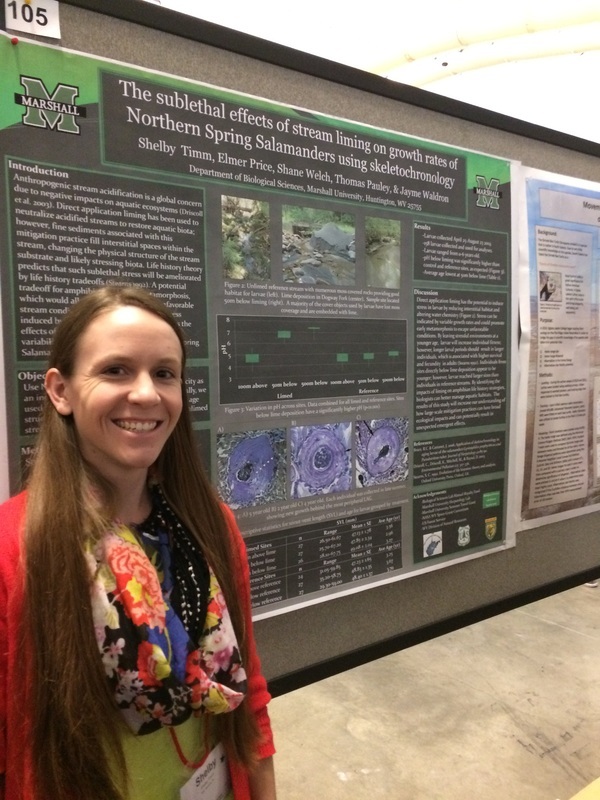 Rachel Arrick: The Influence of Developmental Stage, Habitat, and Captivity on the Cutaneous Bacterial Communities of Eastern Hellbenders (Cryptobranchus alleganiensis alleganiensis) in West Virginia. 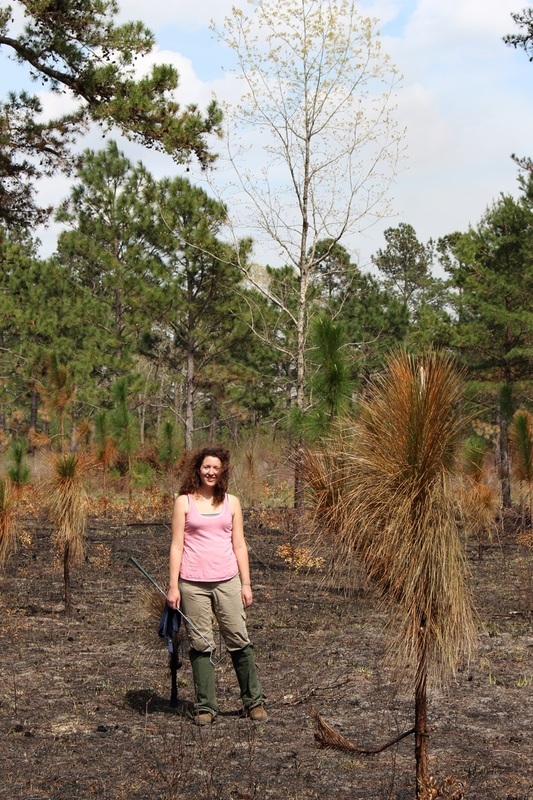 Next up: Rachel is working for the USDA Forest Service in the Monongahela National Forest office. Jonathon Cooley: Survival of Neonate Eastern Diamondback Rattlesnakes (Crotalus adamanteus) in an Anthropogenic Landscape. Check out this episode of Coastal Kingdom..... featuring the MU Herpetology and Applied Conservation Lab's own Katelyn Amspacher and her fox squirrel research. 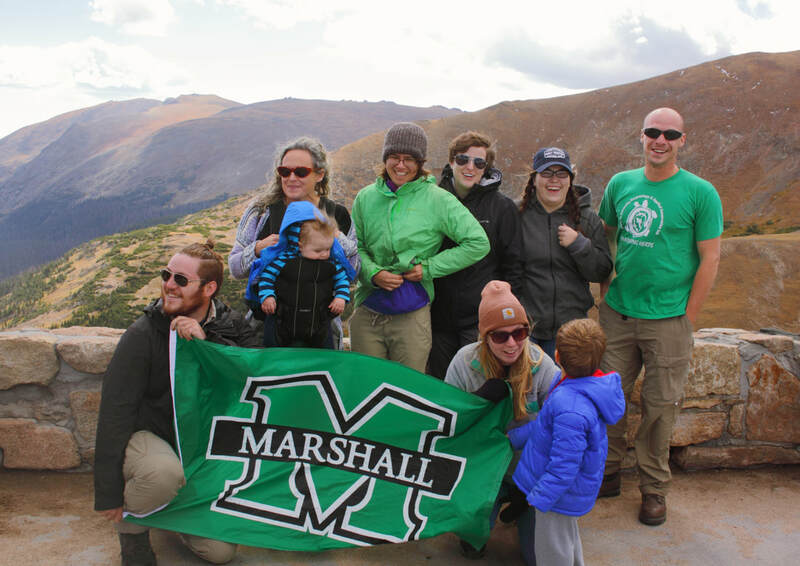 The lab recently went to Rocky Mountain National Park to participate in the Pathways 2017 (human dimensions of wildlife management) conference. Two oral presentations and one poster presentation were given, and much fun was had! Matt Grisnik, M.S. student in the Herpetology & Applied Conservation Lab, successfully defended his thesis on December 9, 2016. Congratulations, Matt! Next up: Tennessee Tech University. Matt accepted a PhD position in Dr. Donald Walker's lab, where he will be studying the probiotic microbiome of endangered Tennessee bats. Congrats to Berlynna Heres for winning the SSAR Victor Hutchison student poster award at the Joint Meeting of Ichthyologists and Herpetologists in New Orleans! Great job, Berlynna! Berlynna Heres, M.S. 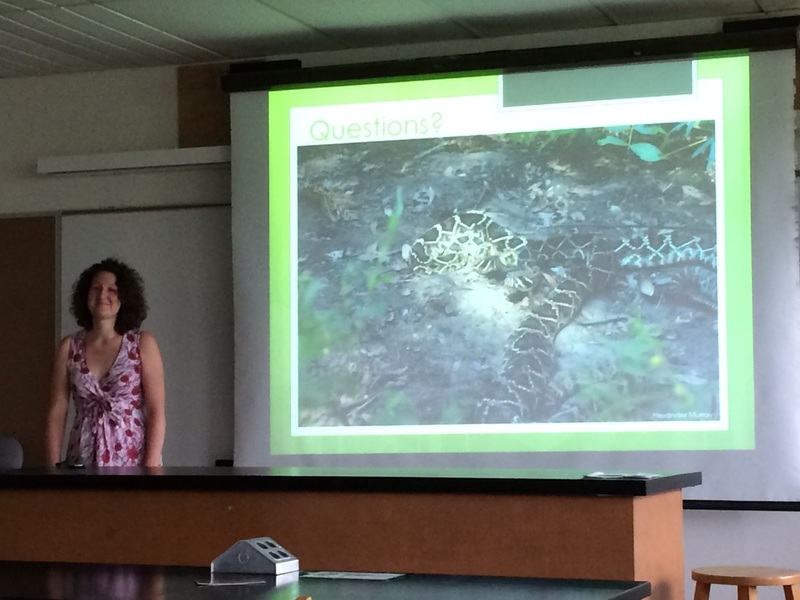 student in the Herpetology & Applied Conservation Lab, successfully defended her thesis on April 22, 2016. Congratulations, Berlynna! Next up -- University of Maine, Orono. Berlynna accepted a PhD position in the Maine Cooperative Fish & Wildlife Unit, where she will be working with Joseph Zydlewski on an American eel project. Elise Edwards, a 2014 graduate of the Herpetology and Applied Conservation Lab, recently published one of her thesis chapters!! Congratulations, Elise! Edwards, E., T. K. Pauley, and J. L. Waldron. 2016. Estimating Spring Salamander Detection Probability Using Multiple Methods. Journal of Herpetology 50: 126-129. 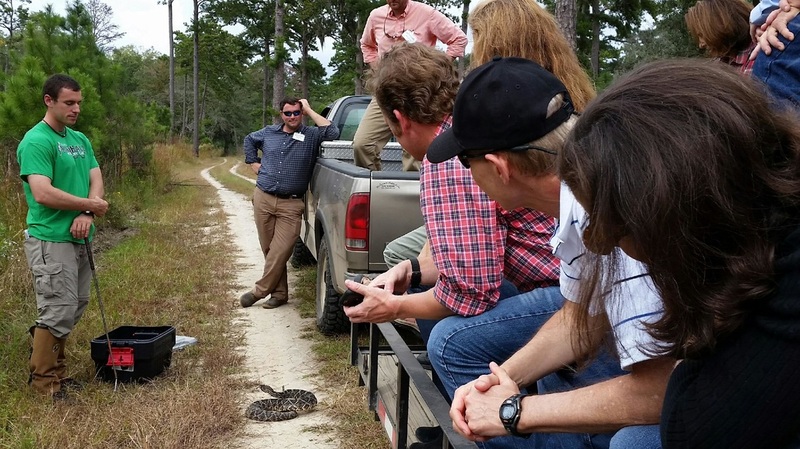 Jonathon Cooley, graduate assistant in the Marshall University Herpetology & Applied Conservation Lab, and some eastern diamondback rattlesnakes recently conducted an outreach program for the Friends of Nemours Wildlife Foundation. Brad O'Hanlon, recent graduate of the Herpetology & Applied Conservation Lab, won first place for his student presentation (The Spatial and Behavioral Effects of Anthropogenic Landscapes on Eastern Diamondback Rattlesnakes) at the Gopher Tortoise Council annual meeting in Covington, Louisiana (Oct 16-18, 2015). Awesome job, Brad! 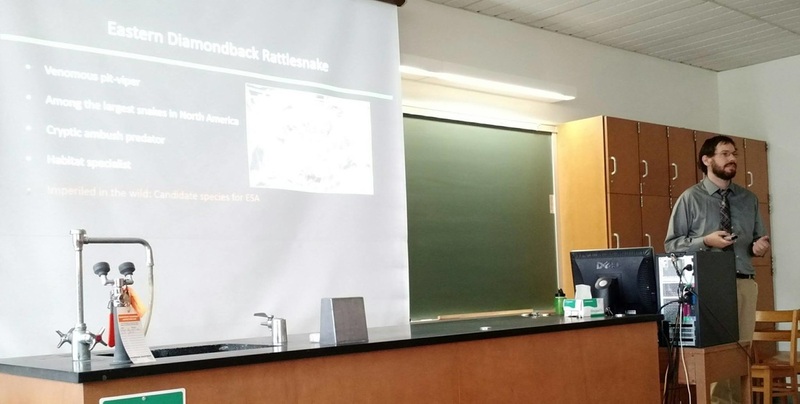 On September 28, 2015, Brad O'Hanlon, a graduate student in the Herpetology and Applied Conservation Lab, successfully defended his thesis, Spatial and Temporal Patterns of Eastern Diamondback Rattlesnake (Crotalus adamanteus) Movement and Behavior in Response to Anthropogenic Landscapes. Congratulations, Brad! On August 7, 2015, Cory Goff, a graduate student in the Herpetology and Applied Conservation Lab, successfully defended his thesis, Effects of Trails and Roads on Peaks of Otter Salamander (Plethodon hubrichti) and Eastern Red-backed Salamander (Plethodon cinereus) Movement Behavior. Great job, Cory! Patrick McMillan and Jayme Waldron chatting about eastern diamondback rattlesnakes. On May 27th, Expeditions with Patrick McMillan visited of one our study sites to film free-ranging eastern diamondback rattlesnakes. It was a great visit with Patrick and his crew. 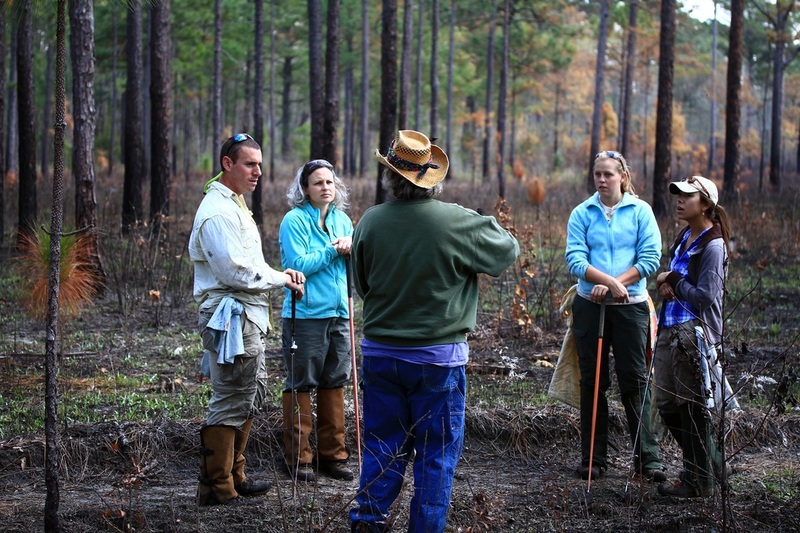 Jonathon Cooley and Berlynna Heres, current graduate students in the Herpetology and Applied Conservation lab, recently gathered with herp lab alumni in South Carolina to collect data on snake ecology projects. It was great seeing Kevin Messenger, Marcie Cruz, and Abby Sinclair! Check out some of our photos below. 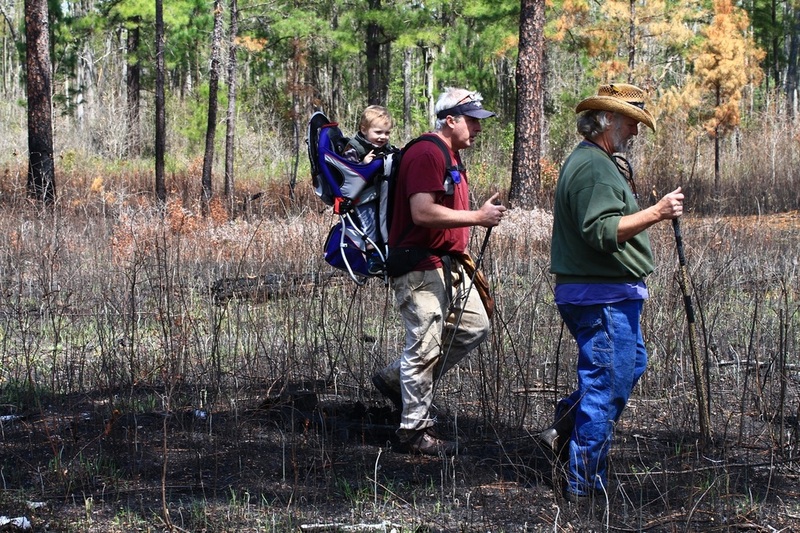 Thanks to Kevin Messenger for sharing his photos! Talking about snakes in the piney woods: From left to right: Jonathon Cooley, Jayme Waldron, Wade Kalinowsky, Abby Sinclair, and Marcie Cruz. Herp lab alum, Abby Sinclair, next to an eastern diamondback rattlesnake. Herp lab alum, Kevin Messenger, holding a coachwhip. Jonathon Cooley and an eastern diamondback rattlesnake. Berlynna Heres, walking a burn. Herp lab alum, Marcie Cruz. What's in that bag?! Marshall University Herpetology and Applied Conservation Lab M.S. student, Shelby Timm, recently accepted a position with the New York-New Jersey Trail Conference Conservation Corps Program as an invasive species crew leader. Congrats, Shelby! Shelby Timm, holding a black racer. Marshall University Herpetology and Applied Conservation Lab M.S. student, Cory Goff, recently accepted a doctoral position at Texas State University under the mentorship of Dr. Caitlin Gabor and Dr. Susan Walls. Congratulations, Cory!! 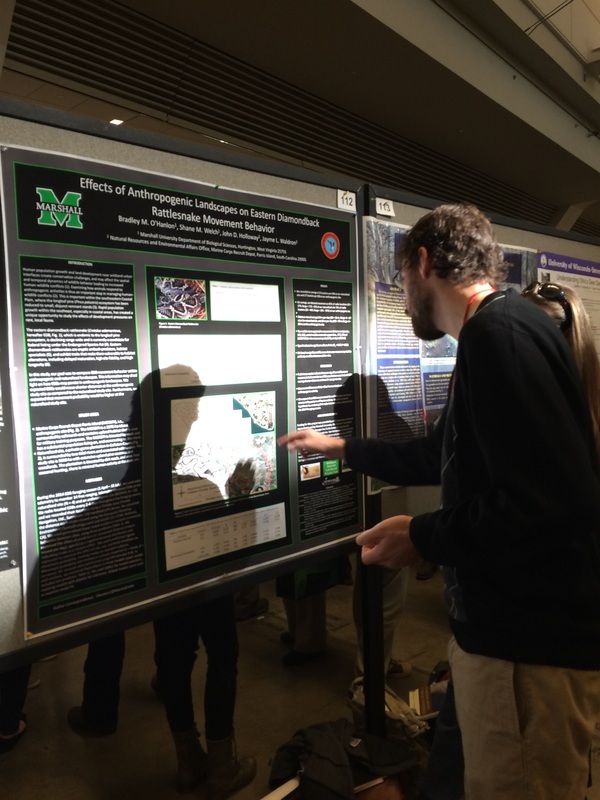 Three herp lab graduate students, Brad O'Hanlon, Shelby Timm, and Cory Goff, presented posters at The Wildlife Society annual conference in Pittsburgh, PA (27 October 2014). 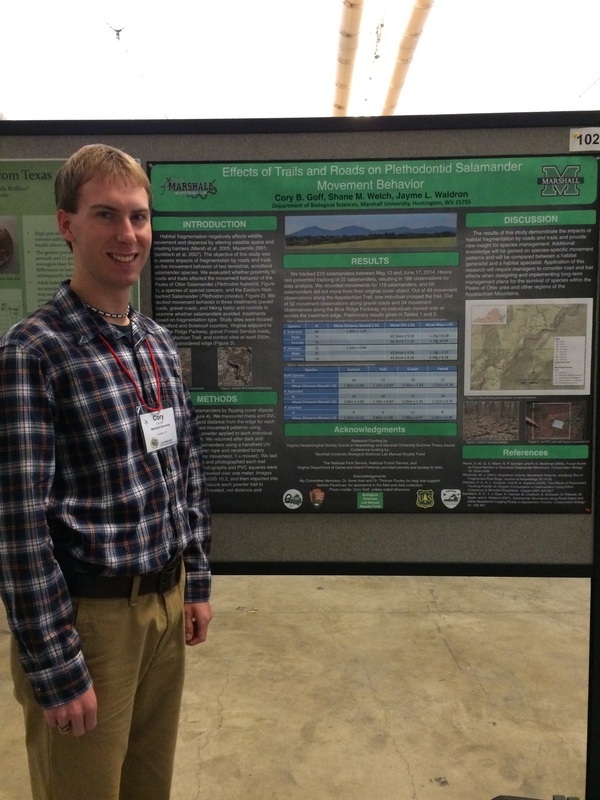 Cory's poster won Honorable Mention in the student poster competition! Congrats, Cory! The herp lab participated in the Davis Creek Watershed Community Educational Outreach Day in South Charleston, West Virginia, on 14 September 2014. Herp lab students (Brad O'Hanlon and Corry Goff) taught local children about amphibian and reptile conservation. Live specimens were on display, including snakes, salamanders, and turtles. Cory Goff, holding a pine snake. Brad O'Hanlon demonstrating how to identify local salamanders.